Yes, we are. She's already almost deaf, becoming blind would have been so sad, we are soooooooo happy for her. This is just phenomenally awesome. I will definitely be showing this to my vet. Thanks for the updates. Best to her and to you. Half of the package is now used, as one month passed, and there is one bottle left. I decided to stop for now, as there is just a hint left, or not, even I can barely see if there is anything left. As the bottle preserves itself for 2 years, I can keep an eye on it, see if it returns and start again. 28 drops, as I forgot twice, the day Yiyi died, and when Binky arrived, and at least 90% is gone, given the fact that it wasn't outspoken to start with. I am over the Moon with this result, this is beyond everything I hoped for. Glad to hear you are so pleased and it as a success! Each pig gets a monthly inspection, besides a weekly weighing session. I pulled up the rollers, to look at Plucky’s eye and was quite surprised that cataract came back in 1 eye with a vengeance. I saw that eye 14 days before, and was in doubt, look how far it progressed in 14 days. I checked it for a hay poke, or infection, for 5 days in a row, to conclude it wasn't anything but cataract. I didn’t see it before, I am light sensitive, and the rollers are usually half way down in the living room, as it’s far too bright there for me. I had a second flask left from the pack of Can-C we bought, so we started again. The other eye is only mildly affected, but as the bottle is open anyway… Hope it works out well for her again! I hope you again have success clearing this up! 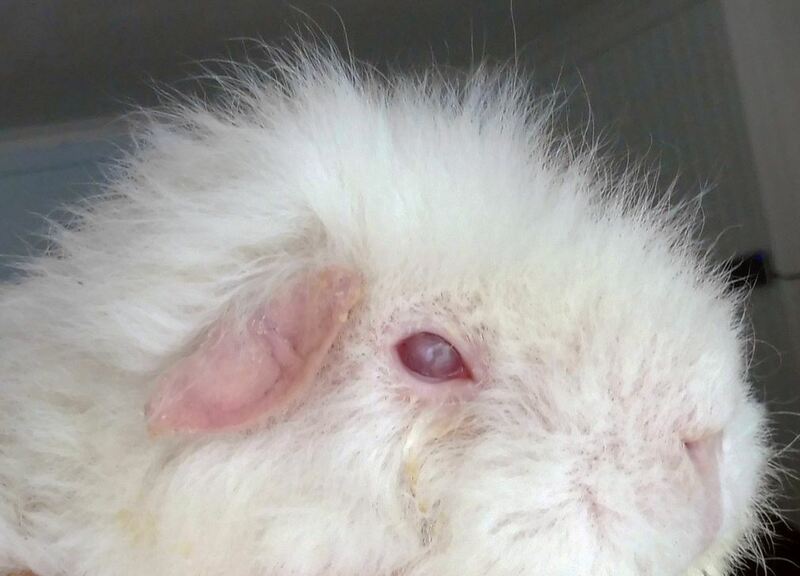 Plucky bumped her worst eye soon after I started, causing an infection, which cleared with antibiotic drops, but left trauma induced cataract. I stopped the treatment. She developed an outbreak of mites soon after that, so decided to wait to resume till those were gone. She got them from Binky, who came from a rescue, so I was surprised he had 'm, as rescues here treat for it. I noticed that her one remaining good eye seems to develop a slight inner start of cataract again recently, so it was time to start again. It's been 8 days now since we started, it has gone down drastically in her good eye. Her white eye also gets treated, and it works on the old age cataract in the lens, and on day 8, she can spot movement with it again. Since the drops don't work on the trauma cataract, it's the best it can do, but it's an improvement. After this, I have one bottle left, I can start again in a few months, when it starts showing again. This time, I keep the opened Can-C bottle out of the fridge. I tried it on a small open wound of mine from a splinter, it really stings minimal, even tap water stings harder. I tried on myself because hub thinks she looks too sad when she has a drop in her eye. I just keep saying she is a drama queen. I even have proof this time. The warmer Can-C seems to sting less in her eye, she only closes it for a few secs now, the cold version made her keep her eyes closed for a minute. As soon as I hold her up to my face, she closes her eyes, as soon as she’s put on my lap, she opens them again. It’s just to get extra kisses and snuggles, rofl, we tried it several times, hahahahah!!! She is one smart cookie! OK, did one more bottle of treatment, which was 25 days. Her white eye with a combination of trauma cataract and old age cataract improved so taht she can she light. You can also see it's a bit less white. So, the drops reduced the old age cataract in it. He good eye has improved very well. Will open up a new bottle when I see her good eye deteriorating again. Very pleased with this result once more.